One of the best parts of living in Orlando is having a pool in your backyard to enjoy. Skipping out on long trips to the beach or public pool, you have your own little oasis to retreat to at any time. However, there are a lot of things you have to keep in mind to keep your pool enjoyable. With that in mind, we’ve gathered these benefits you stand to gain by letting a professional pool cleaner take care of your maintenance. Need more info? Call Infinity Pool Service today! Unless you’re an expert when it comes to pools, there are many different tasks to stay on top of to keep your pool in good shape. When you have a professional clean your pool, you can rest easy knowing everything is covered and taken care of. That leaves you free to enjoy your swimming time without worrying if your pool is clean and in good condition. Life seems to get more hectic with each day that passes. Between getting to work, picking kids up from school, preparing dinner, and everything in between, there are many things that can slip through the cracks. By signing up for a regular pool cleaning service, you can rest assured the pros will keep you on schedule, keeping your pool clean, hygienic, and beautiful. When you have a pool professional conducting maintenance and cleaning, they’ll check the mechanisms that keep your pool working. Regular inspections of pumps, filters, and even the integrity of the pool itself can help avert potential disaster, and repairs can be performed as necessary. How much do you remember from your high school chemistry class? If you’re like most people, not a lot. The chemicals in pool water need to be checked and balanced on a regular basis, and it can be tough to hit the right levels if you’re not familiar with the intricacies. Let a pool pro take over for you — they have the knowledge and experience necessary to keep chemicals balanced, which will fend off bacteria growth and blooming algae. We know how busy you are. You might not have the time to devote to keeping your pool clean every week. A professional pool cleaner will maintain your pool in a way that makes you proud to show it off, saving you time. Additionally, thanks to the preventative maintenance performed, you can save money in the long run since you won’t have to spend money on replacements and repairs for broken equipment. Having a pool is one of the most fulfilling and enjoyable things about living where the weather is warm just about all year long. Do you need a little assistance in keeping your pool looking pristine? 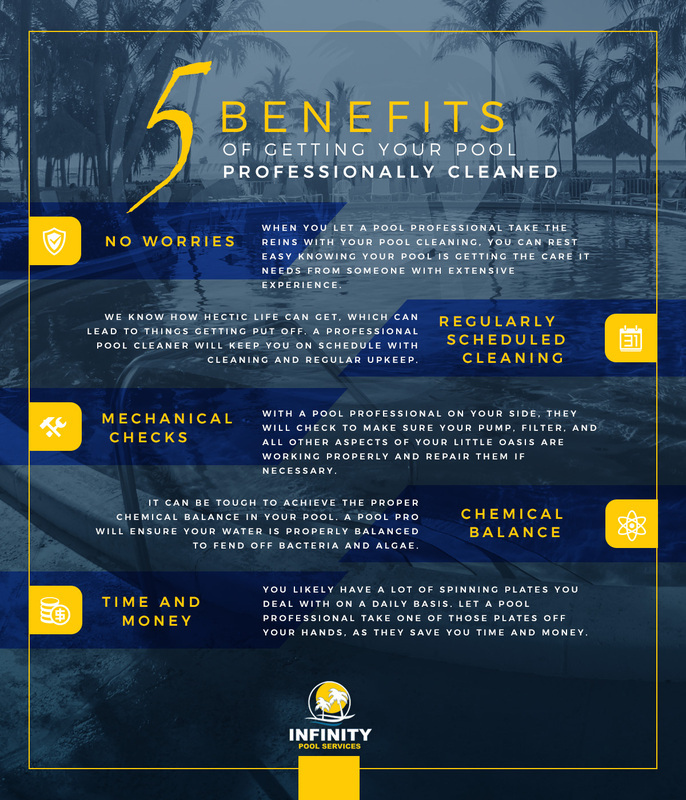 Call Infinity Pool Services in Orlando today to schedule your appointment!